Understanding how your private health insurance benefits you is important, so we have put together some frequently asked questions to help you understand the private healthcare system. What doesn't private health insurance cover? Am I covered for a condition I had before I took out private health insurance? Does my income affect whether or not I have to have private health insurance? How can I claim the Australian Government Private Health Insurance Rebate? Why is the government rebate so important? Why does the idea of a rebate work so well? Does private health insurance favour older people and the benefits they need? Can I still access Medicare if I have private health insurance? Why do I have to pay the Medicare Levy Surcharge when I have private health insurance? I've come across medical jargon. What does it mean? What is Informed Financial Consent? You may purchase private health insurance to cover all or some of the costs of health care as a private patient. There are two types of private health insurance cover available: hospital cover and general treatment cover (ancillary or extras cover). Hospital insurance covers all or some of the costs of hospital treatment as a private patient including doctor’s charges and hospital accommodation. This applies when you are a private patient in a public or private hospital or day hospital facility. General treatment cover helps with the cost of non-medical services such as physiotherapy, dental and optical treatment. Some funds offer packaged products that cover both hospital and general treatment services. Generally, the more extensive the health cover, the greater the premium. When choosing your private health insurance, it is important to make sure it suits your individual needs, as well as your budget. Insurers should provide you with the information to make an informed choice about a private health insurance cover that is appropriate for you. Private health insurance allows you to be treated in a private or public hospital as a private patient. This means that you may be able to choose the doctor that treats you, the hospital you are treated in and a time for treatment that suits you. Private health insurance also provides cover for services not covered by Medicare such as physiotherapy, dental, optometry and podiatry services. Many people rely on private health insurance to access services they would otherwise be unable to afford. The decision to purchase private health insurance is a personal choice. Those who cannot afford the premiums or do not wish to take out private health insurance can access the public hospital system through Medicare on the basis of clinical need. If you purchase hospital cover with a private health insurer, you will be covered for some or all of the costs of being a private patient in either a public or private hospital. Alternatively, you can still be treated as a public patient in a public hospital at no charge to you under Medicare, should you wish. The exact amount of hospital treatment you are covered for depends on the level of hospital cover that you purchase, as well as the hospital and doctor you choose and whether they have an agreement with your insurer. (You should review your cover with your health fund and discuss costs with your doctor before surgery). Private health insurance does not cover medical services that are provided out of hospital and which are covered by Medicare. These services include GP visits and consultations with specialists, in their rooms, and diagnostic imaging and tests. Private health insurance may not cover the total cost of the doctors’ services provided to you in hospital, which may leave you with an out of pocket expense. This out of pocket expense is referred to as a ‘gap’. The size of the gap will depend on the fee your doctor charges. Individual health funds can inform you whether they offer a product that covers you for all or part of the gap, and will provide details of the doctors and hospitals with which they have agreements to cover the gap. Please check with your health fund to see what it offers. When you join a health fund or increase your level of cover you may have to wait some time before you are able to claim benefits. This waiting period protects you and others in your health fund by making sure that people cannot join a health fund solely for the purpose of making a claim, and then dropping their cover. This type of “hit and run” behaviour results in increased premiums for everyone. If you were ill before you took out private health insurance, you will have to serve a pre-existing condition waiting period before you are covered for treatment associated with your illness. This waiting period is usually 12 months; however, you should check this with your fund. No, the decision to purchase private health insurance is entirely up to you. However, if you are eligible for Medicare, and you earn an annual income in excess of $90,000 for singles and in excess of $180,000 for couples/families (with family income being adjusted by $1,500 for each dependent child after the first), you will be required to pay the Medicare levy surcharge if you do not have an appropriate level of private hospital cover. The surcharge is calculated at the rate of 1% to 1.5% of your income for Medicare Levy Surcharge purposes. It is in addition to the Medicare Levy of 2%, which is paid by most Australian taxpayers. The surcharge is administered by the Australian Taxation Office. To receive your health insurance rebate you must be with a registered health fund. For further information about claiming the rebate please visit the ATO’s Claiming Your Rebate web page. Whichever way you choose to receive it, the Australian Government rebate on private health insurance is there to make private health cover more affordable for more Australians. By making private health insurance more affordable for more Australians, the Australian Government’s Private Health Insurance Rebate has helped balance Australia’s public and private health systems. Before the rebate, many people found it difficult to afford to stay covered and this increased the pressure on Medicare. At the moment, nearly 13.5 million Australians have private health insurance (55% of the Australian population). Private health insurance pays for close to two-thirds of non-emergency surgeries in hospitals, evidence that the Australian Government’s private health insurance rebate has made a huge contribution to the Australian health system. Because of the partnership between the two systems, if people leave private health insurance, the cost of providing private health insurance and public health care both rise. The balance between the private and public sectors in Australia works well. When prople drop their PHI it means premiums increase as does pressure on the public hospital system. Fewer people with private health insurance means costs are shared between a smaller pool of people, and therefore premiums increase, which means even fewer people can afford private health insurance. As a result more people have to rely on Medicare only, which increases demand for public hospital services, and costs Governments (and the taxpayer) more money. In fact, it would cost the Australian Government more to allow private health insurance to diminish than to continue to support people who choose it. If private health insurance disappeared, the cost of providing public hospital treatment for the same number of patients would escalate dramatically. In 2008–09, private hospitals in Australia performed procedures that Private Healthcare Australia estimates would have cost the public hospital system over $11 billion to carry out. The cost of supporting private health insurance through the Australian Government’s Private Health Insurance Rebate in 2008-09 was significantly less at $3.9 billion. No. In fact, private health insurance funds often pay claims of $50,000 to $100,000 — sometimes even more — to patients aged under 30. Private health insurance is structured fairly, with benefits to suit all ages and all health needs. The Australian Government’s Private Health Insurance Rebate encourages people to not only join private health insurance but also to remain insured. The rebate, together with reforms including Lifetime Health Cover and the Medicare Levy Surcharge have helped to redress the previous imbalances in the Australian health insurance system. Yes, even if you have private health insurance you are able to access the public hospital system through Medicare and be treated as a public patient in a public hospital under Medicare at no charge. No. Health funds are not allowed to refuse membership to people on the grounds of health status, age or claims history and must charge everyone the same premium for the same insurance policy. This is known as Community Rating and ensures PHIS is fair and accessible in Australia. Health funds can however impose waiting periods for pre-existing ailments. The Medicare levy surcharge (MLS) is designed to lessen the demand on the public Medicare system. You will be required to pay the MLS if your income for MLS purposes is above the base income threshold and you or your family do not have an appropriate level of private patient hospital cover. This applies unless you are exempt from paying the Medicare levy and your dependents are also exempt or have an appropriate level of private cover. Further information regarding MLS thresholds and rates. The Government supports universal access by all Australians to public health services under Medicare, irrespective of private health insurance status. Those with private insurance can therefore choose to use Medicare or private hospital services depending upon their particular health needs. In addition, privately insured patients using private hospital services still draw substantially upon Medicare as well their insurance. For example, Medicare funds 75% of the Medical Benefits Schedule (MBS) fee for privately insured in-hospital medical services and also funds 85% (MBS) rebate on out-of-hospital medical services (e.g. GP visits) for all Australians and the Pharmaceutical Benefits Scheme (which subsidises the costs of pharmaceuticals). Yes. You can change insurance policies at any time. However, if you change to a higher level of cover you may have to serve a waiting period before you can claim benefits at this higher level. This includes transferring to policies with lower excesses or co-payments. This is the amount you agree to pay for hospital services in exchange for lower premiums. In some cases you will contribute each time you go to hospital and in other cases you only have to pay a set amount each calendar year. For example, if you agreed to a $250 excess you will pay the first $250 of your hospital costs if you’re admitted as a private patient. Some policies only charge the excess if you’re admitted to hospital rather than having day surgery. Health funds have set waiting periods before you are entitled to certain benefits. These waiting periods will be clearly stated in your policy and will only apply to some services. If you are thinking of starting a family and you would like to use one of the deluxe birthing suites in a private hospital, it pays to adjust your health insurance well in advance because there is a 12 month waiting period for obstetrics. If you are going to hospital at any other time it is always best to call your health fund to check your eligibility. 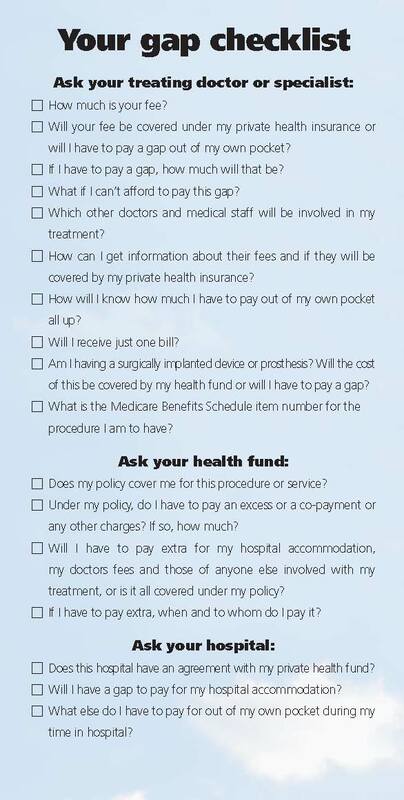 These are the ‘extras’ offered in your health policy. Coverage may depend on your type of policy and your fund but they generally include a variety of services such as physiotherapy, dental, optical, podiatry and some alternative therapies. This is where you agree to pay a part of each hospital service you use. For example, if your policy has a $50 co-payment clause, you will pay $50 each day towards hospital accommodation. In this case a week in hospital would cost you $350. If you think there are services covered by private health insurance that you do not think you will need, some funds will take them off your policy for you in exchange for a premium discount. The danger in doing this is that it is difficult to predict your future health needs with 100% certainty and it is always better to have more insurance than not enough. Before you agree to medical treatment or a surgical procedure, your doctor should discuss all charges you may have to pay out of your own pocket. This is called informed financial consent. Further information is available under What is Informed Financial Consent? LHC applies to everyone born after 1 July 1934 and it sets your premium rating for life when you first take out private health insurance hospital cover. If you do not have hospital cover on the 1st of July following your 31st birthday and then decide to take out hospital cover later in life, you will pay a 2% loading on top of your premium for every year you are aged over 30. For example, if you take out hospital cover at age 40 you will pay 20% more than someone who first took out hospital cover at age 30. The maximum loading is 70%. Once you have paid a LHC loading on your private hospital insurance for 10 continuous years, the loading is removed as long as you retain your hospital cover. The gap is the difference between what your doctor charges and what Medicare and your health fund will pay for a particular service, which you must pay out of your own pocket. Some doctors have an arrangement with a health fund and don’t charge a gap fee, but whether or not you have to pay some of the costs will also depend on your level of cover. The Government sets a fee for every medical service in the Medicare Benefits Schedule (MBS). When you have hospital treatment as a private patient, Medicare will pay 75% of the MBS fee. Your private health insurer will pay 25%. Gaps for doctors’ fees come about when your specialist, and/or the other doctors involved in your hospital care, charges more than the MBS fee. Your insurer can pay more than 25% of the MBS fee, if the doctor is prepared to use its “gap cover arrangements”. In this circumstance, you will either have no gap to pay, or you will be informed in advance about any gap. Many doctors are prepared to use gap cover arrangements. Doctors can choose, on a case-by-case basis, whether they wish to use an insurer’s gap cover arrangements. If you doctor chooses not to use your insurer’s gap cover arrangements, you would be required to pay the gap between the MBS fee and the total charge out of your own pocket. How can I find out about any gaps? Many people with private health insurance are concerned about the gap. Right now, more than 83% of all privately insured medical services in hospital have no gap at all. But you still have the right to find out what gap, if any, there might be for your medical treatment. So before you begin your treatment or hospital stay, you can feel confident in knowing whether there will be a gap and how much it will be. Some funds have specific information on their site, or you may have to contact them to obtain details of their gap cover arrangements. Before you agree to medical treatment or a surgical procedure, your doctor should discuss all charges you may have to pay out of your own pocket (gaps), by all the relevant services providers involved in your treatment or hospital admission. Knowing how much your treatment will cost is called Informed Financial Consent. Ask your treating doctor or specialistwherever practical how much their fee will be, and if you will need to pay a gap. For major treatment this information should preferably be provided in writing. You may have more than one doctor involved in your treatment, for example, a surgeon and anaesthetist. Your surgeon should be able to advise who else will be treating you and how you can contact the other doctors to seek fee information from them. You may have lower or no out-of-pocket medical costs if your treating doctors elect to use your health fund’s gap scheme. You are entitled to ask your doctors if they will use your fund’s gap scheme. If you are unable to negotiate a suitable outcome with your doctor, you may wish to contact the Private Health Insurance Ombudsman on 1300 362 072 for assistance. It is estimated that millions of dollars are lost every year within Private Healthcare through fraud and inappropriate claiming. Receiving a benefit payment where there is no legitimate entitlement, submitting deliberately misleading or false information or withholding relevant information. Fraud takes place when a healthcare provider or health fund member provides misleading or false information, or withholds information to gain a financial advantage for themselves or another person. Inefficient and inappropriate use of resources: Our health care system has finite funding and for private health insurance this is the sum of premiums paid into insurers. Fraud causes resources to be diverted away from payment of necessary services to pay illegitimate claims and ultimately affects us all through a need to increase premiums. To combat fraud losses, Health Funds around the world engage in a variety of activities designed to either prevent such losses or detect and recover them on behalf of their members. Private health members, the general public and healthcare providers are a vital part of that role and are encouraged to report concerns. The vast majority of people are honest and use private health insurance services fairly, but if you have information about someone misusing these services, please contact the private health insurer(s) involved directly. View a list of appropriate contacts. You can remain anonymous, and the information you provide will assist in ensuring funds support those who really need them. A specific fund(s), please contact the fund directly. View a list of contacts.